Donated when she was 12 due to family breakup. Very difficult mare to work with on her arrival, but she has mellowed and we have learned to be very careful. 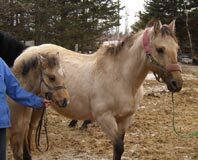 She is a broodmare as well and is a wonderful mother. Her babies are Budd, Shesahe, Vanilla and Total.